Blessed with true visionary leadership ability, Dr. Brown has been able to transform a God given vision from the ashes of thought into the material of reality. He is the senior pastor and founder of Christian Joy Center, which is the nucleus of Evangelical Christian Church Ministries, an organization he also founded. He is the CEO of a thriving ministry and is the owner of four businesses in the El Paso, Texas and Alamogordo, NM area. Organized under Bishop Brown´s leadership, his church has been able to erect a beautiful 42,000 square feet edifice, which houses a full time church staff and a school from Nursery 2 to 6th grade. Christian Joy Center has its own Advertising Agency, Publishing Company, and is presently working on charting a CJC Federal Credit Union. Dr. Brown attended the University of Maryland concentrating in social psychology and has earned a Doctor of Ministry in Biblical Studies from FICU where some of the nation’s most well known pastors have attended. He is the author of thirteen books, a professional blogger (www.MikelBrown.com), and is the owner and CEO of Power Communications Network through which he conducts financial seminars and special events. Dr. Brown is a well sought after speaker for conferences, corporations and churches. He has lectured at Universities, been a motivational speaker for K-Mart´s sales personnel, and U.S. Army Chaplin Corp in West Germany. He owns an Internet Television Station called JOLTV.com (Joy of the Lord) where his programs and seminars can be seen streaming live. He has been a keynote speaker traveling half way across the globe to Europe, Africa, and the Bahamas. His much sought after style of speaking with humor that tickles the very soul has opened many doors for him. With his real life experiences from business to family life and from spiritual to social, you are sure to enjoy an evening with Dr. Brown. 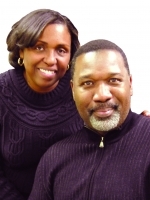 Dr. Mikel Brown resides in El Paso, Texas with his wife and children.